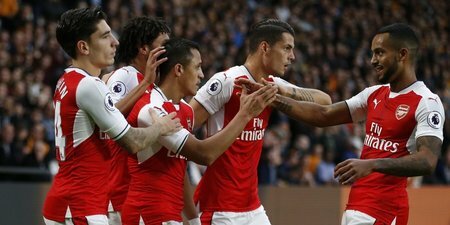 Sunday sees top four hopefuls Arsenal and Manchester United go head-to-head in one of the Premier League’s most significant fixtures. We take you through our match preview and betting tips for the crunch clash at the Emirates stadium, with both teams needing a result. Manchester United have beaten Arsenal only once in their past five clashes, but the last 19 meetings – going back to 2008 – have seen the Gunners win only three times, losing eleven. The fixture earlier in the campaign saw Olivier Giroud’s last-minute header rescue a point for Arsenal at Old Trafford with their only effort on target in a one-sided encounter which left United hugely frustrated at their lack of prowess and decisiveness in the final third. This fixture last season saw Arsene Wenger’s side win 3-0 with all three goals coming within the opening 19 minutes, including a double from Alexis Sanchez. However, the French manager has never defeated a Jose Mourinho side in a competitive game, despite the two clashing 15 times – only the 2015 Community Shield match saw the Gunners defeat Chelsea. Arsenal have lost eight of their last fifteen games across all competitions – and even that stat is generous, seeing as two of those undefeated matches came against team’s from England’s fifth tier in previous FA Cup rounds. Manchester United are unbeaten in their last 25 league matches, dating back to October’s 4-0 loss at Chelsea – the longest unbeaten league streak in Europe’s major leagues and a club record. However, the run has included 12 draws and see them move up only one place, from 6th to 5th, with Arsenal the only opponents they have leapfrogged. Arsenal have a major doubt over Shkodran Mustafi (thigh) who is likely to miss the game while long-term absentee Santi Cazorla remains unavailable. United are in the midst of an injury crisis, particularly defensively. Zlatan Ibrahimovic, Marcos Rojo (both knee), Luke Shaw (foot), Eric Bailly (muscle fatigue) Phil Jones (toe), Timothy Fosu-Mensah (shoulder) and Chris Smalling (knee) are all expected to miss out for them, although Paul Pogba and Juan Mata should be fit. Manchester United have drawn more times (14) than any other Premier League side this campaign, and are likely to deploy similar tactics that saw them guarantee a point away to Manchester City a week ago. The Gunners have stuttered badly since February and despite home advantage and mass injury problems for the Red Devils, it’s tough to see them bringing an end to the 25-game unbeaten run and Wenger finally chalking up his first significant win over Mourinho. United may try and push at least one of Smalling or Jones back from injury to shore up an injury-ravaged defence, whom they are likely to protect heavily with a deep-lying midfield which will be a key reason why 21/20 on under 2.5 goals is strong market value. The visitors have the second best away record in the division and haven’t conceded more than once since October in a league match, while Arsenal have only scored four in the last four – if United can nullify their creative midfield it’s likely they can rack up another clean sheet.